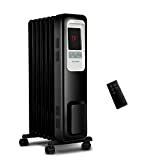 PELONIS - 1500W Electric Radiator Heater: Space Heater • The Air Geeks, reviews of air conditioners, dehumidifiers and air purifiers. As you welcome the chilly season, whether you like it or not, you should be prepared with the right heater to battle the cold. Relying solely on your whole house heating system may lead to skyrocketing bills. However, there are numerous space heaters on the market today, and it could be a daunting task to figure which one suits you better. Luckily for you, we have identified several candidates that might interest you and Pelonis Electric Radiator Heater is one of them. This is an oil-filled radiator space heater that is meant to be a portable supplement for your heating needs. This space heater relies on oil-heating radiation to heat the room air. Oil heating technology has been gaining popularity over the past few years due to its effectiveness, safety, and efficiency. They consist of an oil-filled series of columns and fins that are connected together. To heat the air, the diathermic oil is heated up using a resistor which transfers the heat to the fins. The air surrounding the appliance absorbs the heat and as it rises up, it is replaced by colder air. This cycle continues until the whole room is cozy. This method is slow in distributing the warm air evenly since the warm air rises to the ceilings, so it may take time to feel any temperature change. However, the upside of this heating technology is that it does not reduce the moisture content in the air and it does not counter the humidifier since there is no fan. The lack of fans also makes this heater very quiet. Other types of heaters use fans to force the heated air out of the space heater. This causes that blowing noise and fan-clicking as the thermostat adjusts itself. Rather, this device relies solely on natural convection currents to circulate the air throughout the room. This makes this PELONIS electric radiator suitable during the nights when you want to sleep and are not a fan of white noise. This heater also deploys some cool safety features to avoid burns and fire accidents. There is an overheat protection in case of power overload and a tilt-switch that turns the appliance off in case it is toppled. There is no need the replenish the oil, as it is not a fuel. There are also no exposed heating elements or scorching surfaces which could result in burns or start fires. If your kid accidentally brushes themselves against the heater, they will not burn themselves as it does not get too much hot. It is entirely closed and sealed – there are no grills or vents that could attract dust or debris. You don’t have to worry about some vents getting blocked due to the air intake. Small heavy-duty caster wheels at the bottom enable easy ‘wheeling’ of the appliance from one place to another if you are not a fan of lifting stuff. At 19 lbs, this heater is not the lightest on the market so the caster wheels come in handy. An eco-mode adjusts the room temperature automatically to ensure maximum energy savings. The control panel also features three heat settings where you can choose between the 1500W, the 900W and the 600W modes. Coupled with a thermostat and an adjustable timer, you can set your desired temperature setting using the display unit located at the front-top of the appliance. A remote is included in the package for convenience. The is a temperature setting (40*F-95*F) and with 5*F intervals. This means that you may not be able to set precise figures. This appliance comes with a one-year risk-free warranty. This should get you covered in case there is a defective component. The appliance is very quiet: If you love quiet rooms when sleeping the heater is very efficient that department. Can't set precise figures:The thermostat only sets temperatures at 5F intervals and it is not programmable for different temperatures throughout the day. 1-year Warranty: The warranty covers only 1 year on parts and labor which is considerably short for such a big investment. when I saw programmable, I thought you could program it. hmmm, you can set it to turn on in a certain number of hours and turn off in a certain number of hours. you can't program to come certain temperature at 8 am and certain temperature at 11 pm. bummed." It comes with a big package but after unpacking it, I find it smaller and lighter than I expected. Four wheels are very easy to install. Electronic control board and remote control are very elegant. Will comment on heating effect in the future. " This appliance is a pricey investment especially if you are looking for an affordable appliance. Although, it has enough power to heat your medium to large spaces such as living rooms, offices, bedrooms, and garages. Oil electric radiators have on average a longer lifespan as compared to their counterparts. You will have to be patient though as they take time to heat the room completely. Overall, if you are not bothered by the price, then we would recommend Pelonis Electric Heater Radiator as we feel it is a worthy investment and you shouldn’t hesitate to take it!